I am facing the below issue and am unable to build the application. I am also unable to choose a particular profile. Holy molly, I had to do all this in order for it to work. A picture is worth a thousand words. If you get this error while archiving then continue reading. Go to your app and click on the general tab. Under the signing section, uncheck "Automatically manage signing". As soon as you do that you will get a status of red error as shown below. Now here's the tricky part. 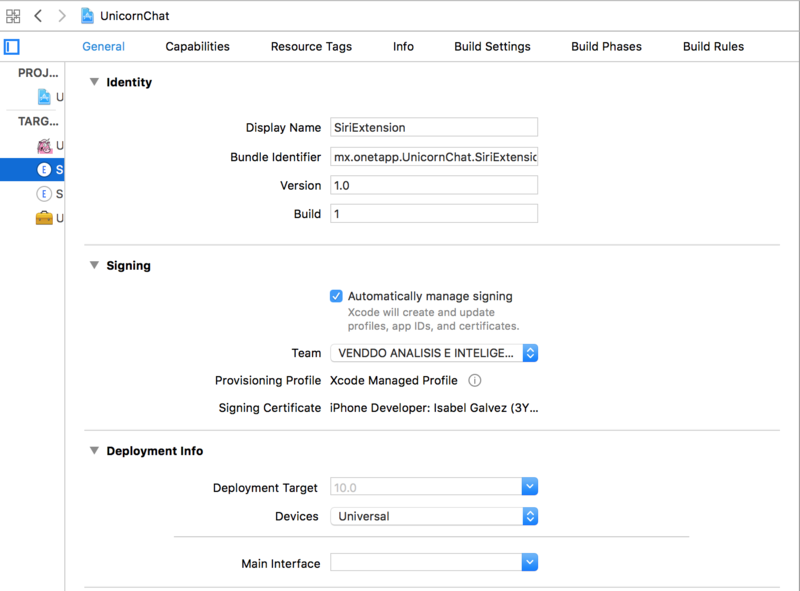 You need to uncheck "Automatically manage Signing" in both the targets under your project. This step is very important. 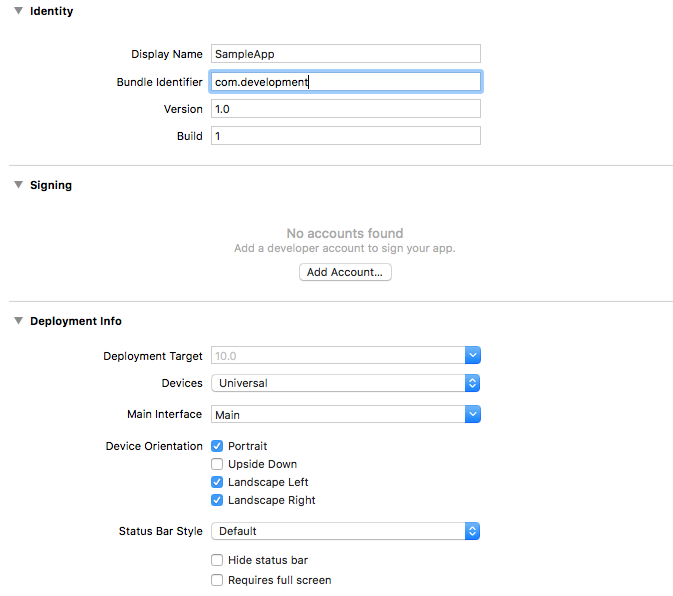 Now go under "build settings" tab of each of those targets and set "iOS Developer" under code signing identity. Do the same steps for your "PROJECT". Now do Xcode → Product → Clean. 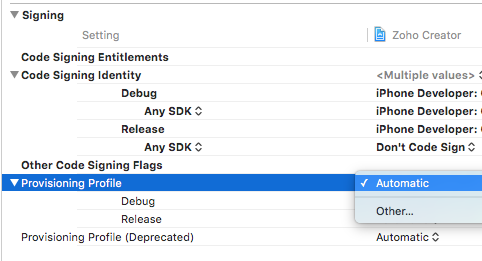 Close your project in Xcode and reopen it again. Do an archive of your project again and everything should work. Really, Apple? Was this supposed to make our lives easier? Great, now we can choose the profile for Debug and Release separately in the general tab itself as illustrated in the image below. 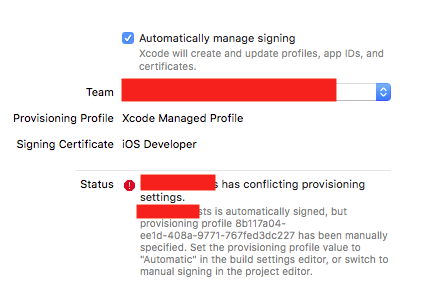 Also when you click on Automatically manage signing it does all process that are created by Fix issue in previous Xcode versions. Disabling automatic and then re-enabling has solved this for me in Xcode 8 GM seed. This can be done in the project settings, info tab for each target that needs to be signed. Log in again with your apple id and build app! This is what I would call a classically Apple Xcode UX design bug. The error said there is a bunch of stuff YOU DID WRONG LOCALLY. 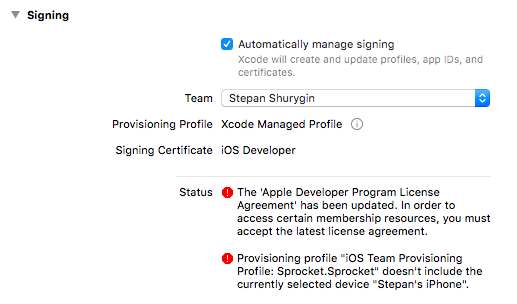 The error actually meant "we have a new agreement you did not accept online".
. Restarting Xcode 8 then cleared that error and only forced me to reselect the certificate I already had on my machine and tied to the project. This could have been handled in a less confusing implementation, but this is how I fixed it. I am putting it here because it's way different than the steps everyone else gave. Oh and yeah, having the pre-latest iOS 10 device and latest Xcode (I was on 7.3.1 or something) also threw errors until I updated. Go to project settings > general > uncheck 'automatically managed profiles' and than 'check' again it will prompt for enable. Set your team for all the targets of your project. Including the extensions. And left the automatic signing management. I only needed to uncheck 'Automatically manage signing', check it again, and rebuild. Click on Add Account if not signed in. 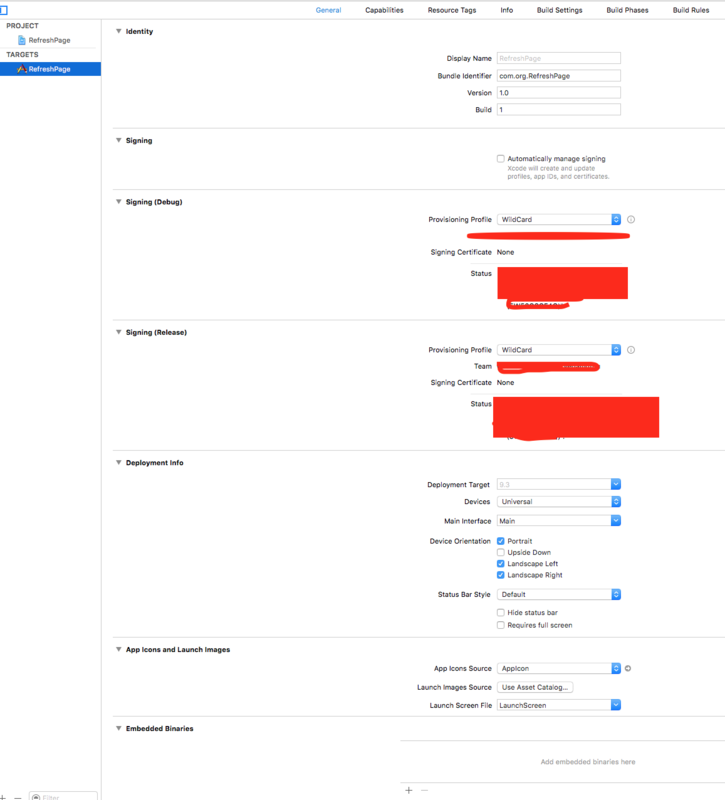 Then after select your team profile and check Automatically manage signing and leave everything else as is in Xcode. It will perform the remaining stuff by itself. The Untick-tick (check-uncheck) "Automatically manage signing".) 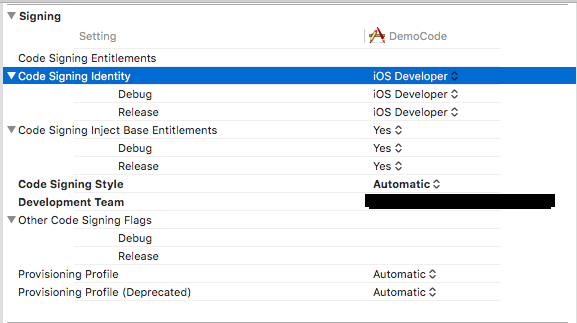 of Xcode checkboxes don't work for me (as many suggested on the top). It happens with frameworks linked in your project. Find your framework or any other target that required signing. Set Don't code sign manually. isn't code signed but requires entitlements. It is not possible to add entitlements to a binary without signing it. My solution is go to the TARGET → General → Signing -> click the Enable signing... button, and I solved the issue. If you are finding the following screen and facing the problem of code signing required, then one of the following solutions may help you. Solution 1. As said before, sign in with an Apple ID. Then you will get options like this, if you enter correct bundle identifier. Then select the appropriate profile from the list. Solution 2. 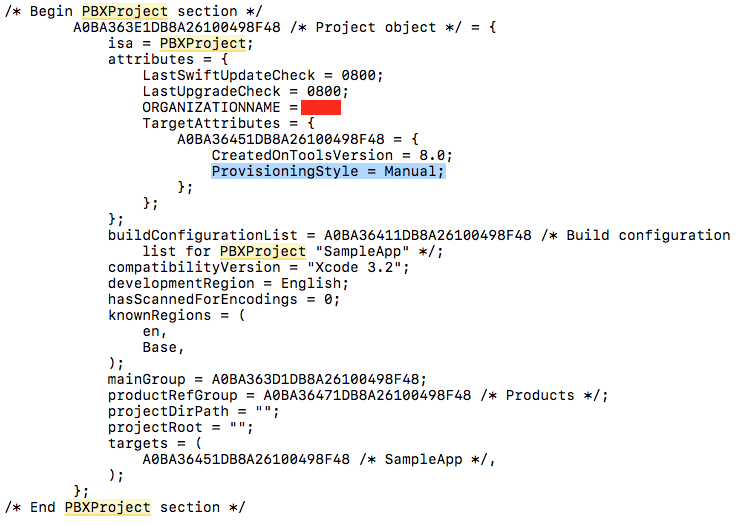 If you don't want to sign in with your Apple ID, then change a small flag in project.pbxproj file. Find the following text in the project file. Change flag ProvisioningStyle = Automatic; to ProvisioningStyle = Manual; Refer to the following image. After changing the flag, you will see the options to select appropriate profile from the list. All answers looks fine but i found still issue so i changed settings in Build like this in XCode 9.0 - Sharing it so it could help someone. Clean -> Build the project. After updating the Provisioning Profile to Empty in Project of Build Settings, everything work fine. 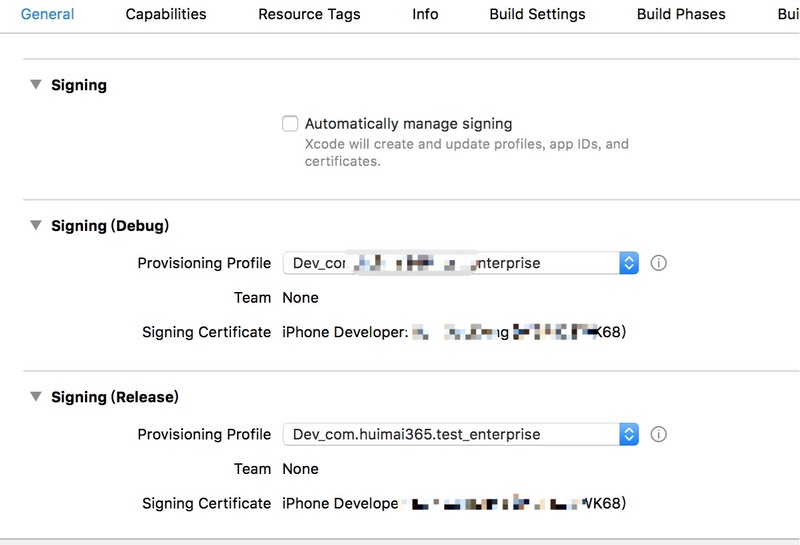 && Code Signing Identity to iOS Developer in every targets Build Settings. I upgraded to Xcode 8, and iOS 10, but I had the problem. I fixed it by going to project general tab, signing section. 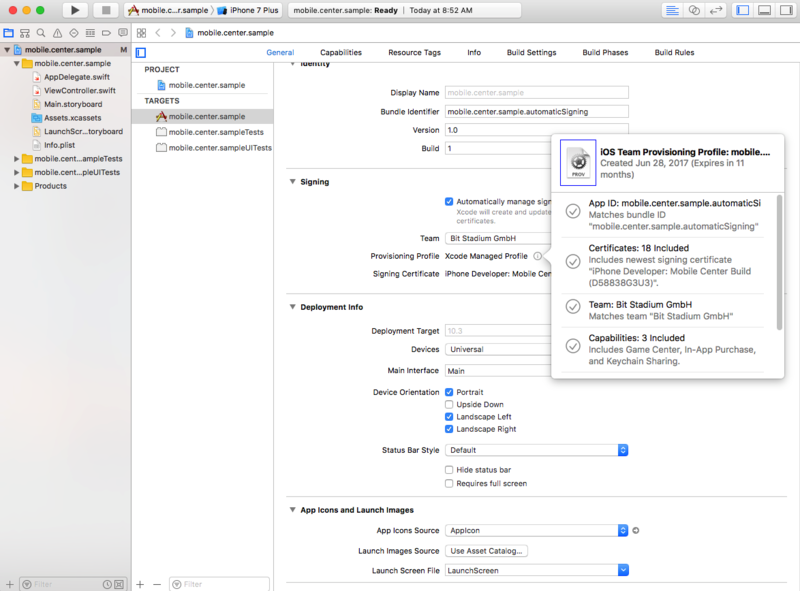 be aware that Mobile center doesn't yet support automatic signing with certificates of type app-store, ad-hoc and enterprise. 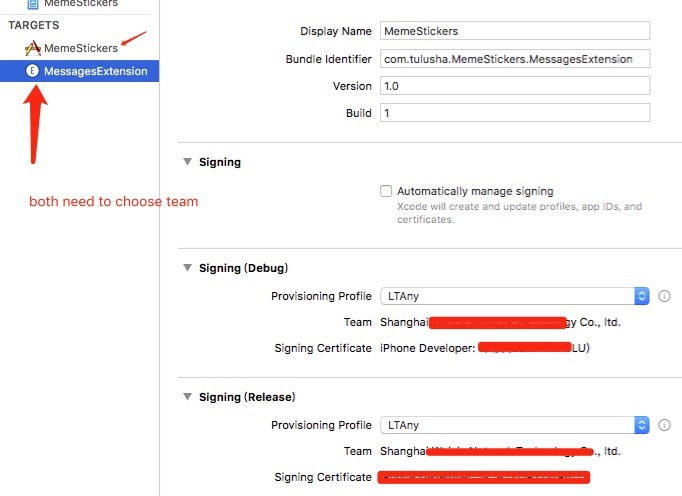 Automatic signing only works with development certificates. Use a development certificate. 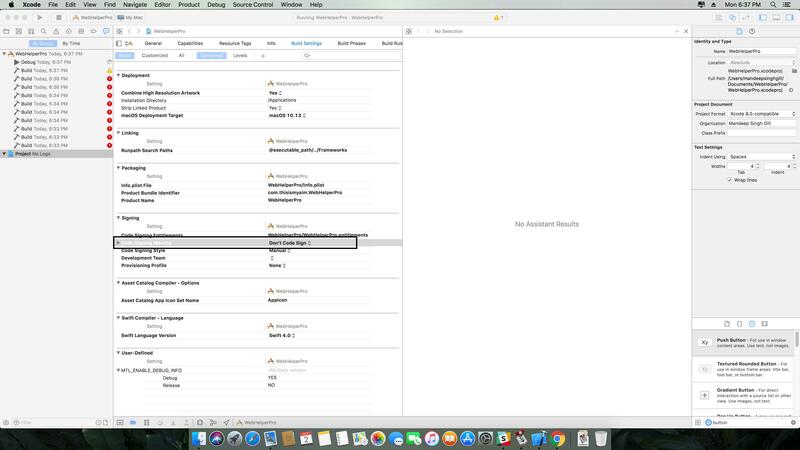 You'll have to create a new one in the developer.apple.com portal, download it to your machine, export it to a .p12 file using keychain, then finally provide it to Mobile Center. You know the drill. Disable automatic signing. 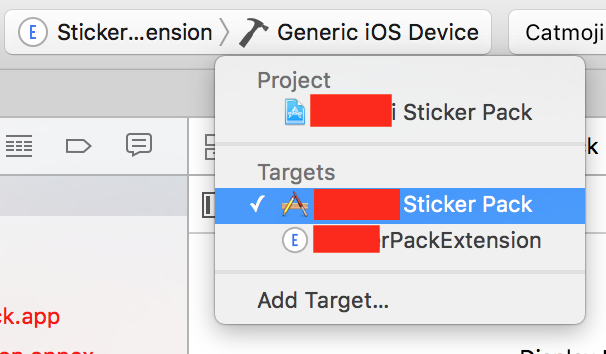 You will find that setting in Xcode in your project targets. 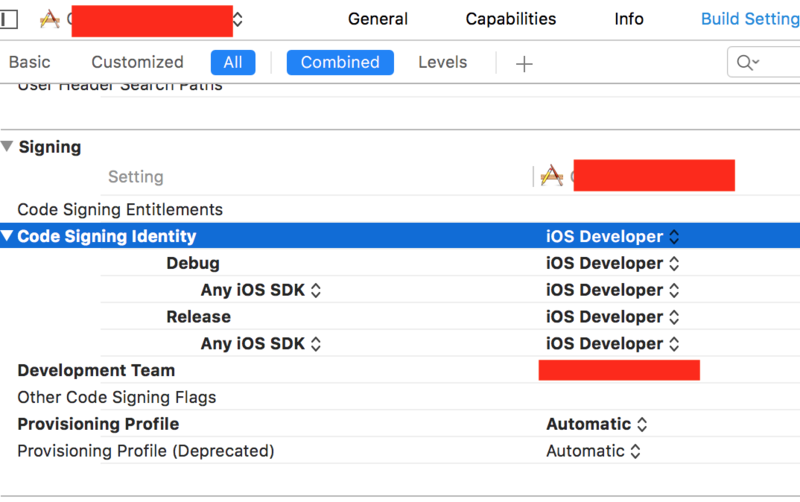 Once disabled, a little "i" button will be displayed next to the "Xcode managed profile" label. Click that button, some info about the profile will be displayed. On the top left corner of that window, a "PROV" icon is displayed. That is the provisioning profile that you should provide to Mobile Center. Drag and drop the icon into the corresponding field in Mobile Center. Clean and Archive your code , Hope it will help you . 1.1: If you are using p12 and a provision file, but not using AppID to log in, do not Select Automatically manage signing. Which means you don't need to set your team. Just select your provision file and the machine code signing identity in Build Settings, like this Build Settings. Make sure the parameters are set as well. And then go back to General. You will see General set, and that's OK. If 1 does not work, try as other answers said, clean your project, delete the derived data folder, quit Xcode, and open again. After deleting all accounts, press the + sign (add) button and sign in with all developer accounts. It is because you have not choosen a team when you created the project. I am such fixed. And I choose it in build settings, but invalid. I must create a new project. "I choose it in build settings, but invalid. I must create a new project." is wrong. It is invalid because I have not chosen it in extension. You must choose a profile at your project's all extension, and there is no need to create a new. I did everything and didn't worked. I uninstalled Xcode 10 and installed Xcode 9.4 then it worked out of the box ! If you still have problem then please try this. It will solved my issue.